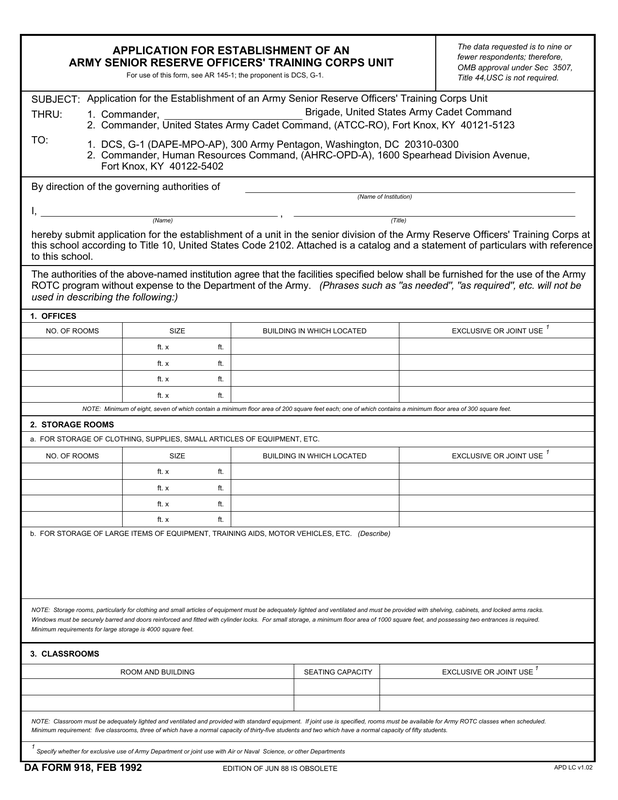 Download DA Form 918, also known as Application For Establishment Of An Army Senior Reserve Officers Training Corps Unit. This form is application for the establishment and maintenance of a Senior Officers division unit. This would be a division unit of the Army reserve at the expense of the United States Government. 1. Enter the name of the commander, brigade, U.S Army Cadet Command. 2.b.- For Storage Of Large Items Of Equipment, Training Aids, Motor Vehicles Etc. Step 5 – Classrooms- complete with information required in the following boxes inside of block 3. Read the Note box at the bottom of block 3.
a.Seating Capacity- maximum seating that will be available that will be in compliance with all permits and fire codes. Step 7 – Indoor Drill Area – (Minimum requirement of 7000 square feet) -Provide the following information. Foot X foot measurements of the gym or other inside area that will be provided. Describe the size of the outdoor drill are yards X yards. Step 16 – Block 17 – Name the official designation of head of institution. Step 17 – Block 18 – Specify the annual rate (based on 2 semester or 3 quarters) of tuition and general fees for both resident and non-resident students.